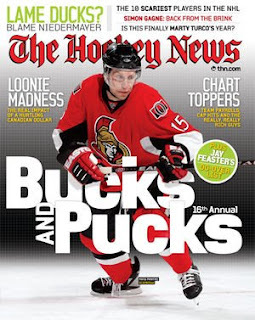 The November 3rd, 2008 issue of The Hockey News is hitting newsstands across North America now. Hockey book enthusiasts will note that this issue is the first issue to include the popular Holiday Gift Guide. This week they list every book available this season, except generally for juvenile titles. While the magazine lists every book often with the cover image, the accompanying synopsis is as brief as can be and offers no real review. You are better off to read online reviews at Amazon, Chapters, and of course here at HockeyBookReviews.com. Still, this issue has always been a favorite of mine over the years. I still look forward to it every year.